RETORIKA: Jurnal Bahasa, Sastra, dan Pengajarannya is a peer-reviewed scientific open access journal, with e-ISSN 2614-2716 and p-ISSN 2301-4768. It has been published by the Department of Indonesian Language Education, Faculty of Language and Literature, Universitas Negeri Makassar in cooperate with Asosiasi Dosen Bahasa dan Sastra Indonesia (ADOBSI) and Ikatan Program Studi Pendidikan Bahasa dan Sastra Indonesia (IKAPROBSI). RETORIKA is published since 2003. RETORIKA is issued semiannually: in February and August. RETORIKA publishes manuscripts on research in language teaching, literature, and linguistics. RETORIKA features research novelties and significance for scientific advancement in one of the fields of the published manuscripts. This journal welcomes submissions from around the world as well as from Indonesia. Manuscripts published include but are not limited to the following. Linguistics; phonology, morphology, syntax, discourse analysis, psycholinguistics, sociolinguistics, and critical discourse analysis. Literature: local literature studies, Indonesian literature, foreign literature studies, children literature, literature studies for character education, and other literary studies. Indonesian Language and Literature: curriculum development, learning methods, learning materials, learning media, assessment, Indonesian language learning across curricula, information and communications technology in Indonesian language learning, language skills, and other Indonesian language learning analyses. The editorial board would like to receive manuscripts submitted via the online submission system. Make sure that the manuscripts meet the scope and submission guidelines of the journal. For more detailed information, please refer to the terms and conditions of RETORIKA. 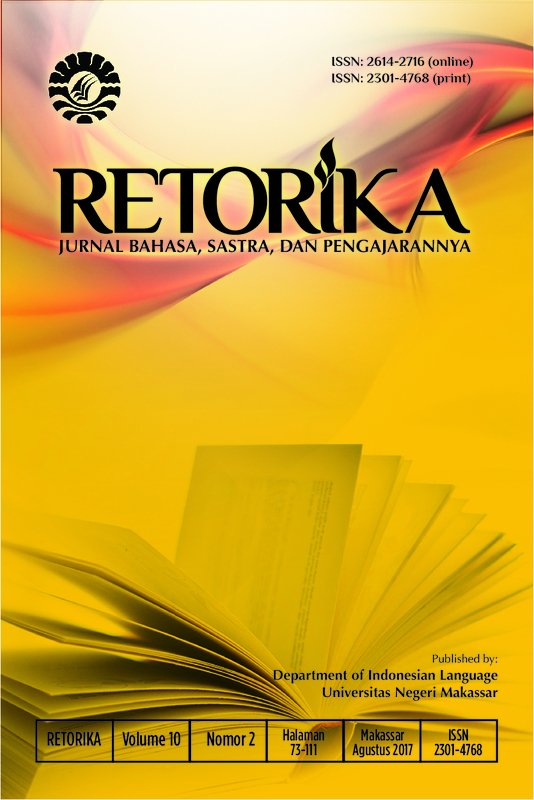 RETORIKA is indexed by DOAJ, Index Copernicus, EBSCO, Google Scholar, Sinta, Garuda, etc. Jurnal RETORIKA mengundang para peneliti/akademisi untuk memublikasikan artikel pada RETORIKA: Jurnal Bahasa, Sastra, dan Pengajarannya. Kirimkan naskah Anda melalui online submission. Department of Indonesian Language, Faculty of Languages and Literature, Universitas Negeri Makassar in cooperate with Asosiasi Dosen Bahasa dan Sastra Indonesia (ADOBSI) and Ikatan Program Studi Pendidikan Bahasa dan Sastra Indonesia (IKAPROBSI). RETORIKA: Jurnal Bahasa, Sastra,dan Pengajarannya is licensed under a Creative Commons Attribution-NonCommercial 4.0 International License.